Everything you need to know about B.Lucky is right there on the logo. Two deranged unicorns flanking a crested shield, engraved with a martini glass, a horseshoe (for luck), Pacman mid-munch, and a clipped gaming ticket. It looks like a cross between Hogwarts, an English pub and some very elaborate brothel. So what the hell is B.Lucky? We’ll do our best to explain. 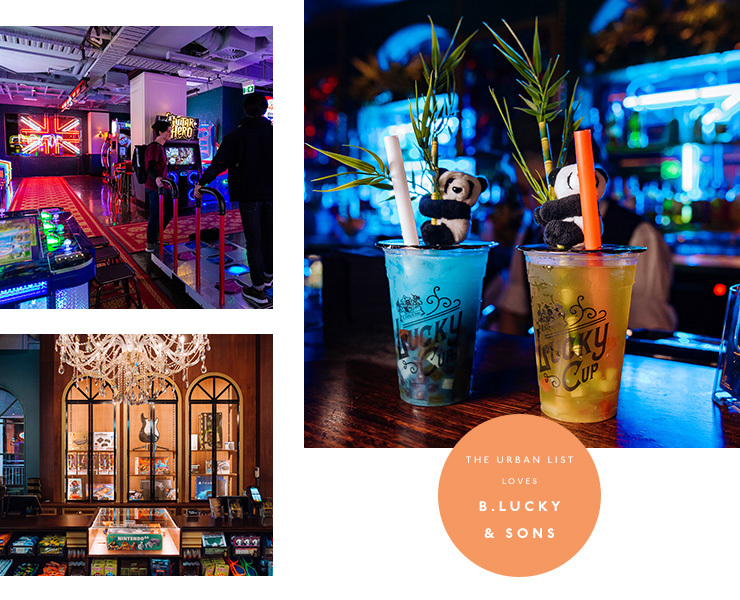 B.Lucky & Sons (to use its full and proper name) is a new venue from the guys behind Holey Moley and Strike Bowling. It’s taken up residence on the top level of Melbourne Central—just look up from beneath the Shot Tower and you’ll see a wall of frenzied neon signage. “Two Free Shirts”, “Cocktail Lounge”, “London Tavern”, a pair of enourmous laser-lit sunglasses. That’s B.Lucky. Inside is what they’re calling “the ultimate adult playground”. Part cocktail bar, bar retro gaming arcade, part novelty pawn shop. 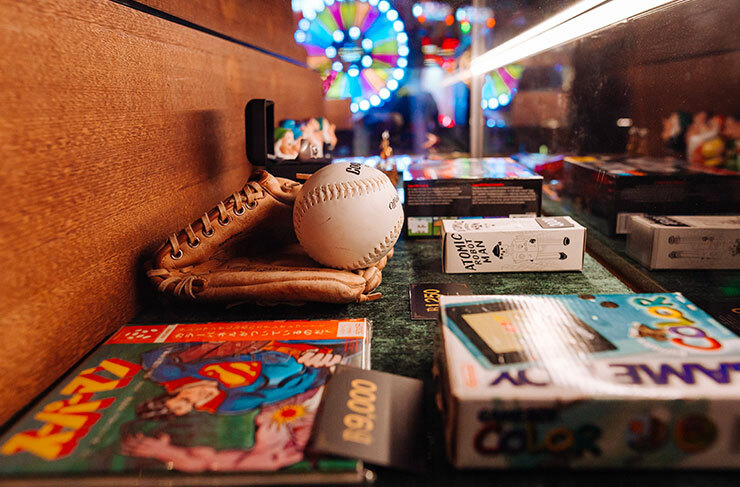 A place where you can knock back a ‘Berry Pop’ bubble cup cocktail, play some Mario Kart, and spend your hard-earned tickets on vintage Michael Jackson LPs, botox injections, Nintendo 64 consoles or diamond necklaces. When we rocked up at B.Lucky earlier in the week, it was already pumping. Melbourne can sniff out a new venue like a pack of rabid bloodhounds, especially if that venue comes with Point Blank and strong booze. The fit-out at B.Lucky must have cost someone several arms and legs. There’s all that neon signage out front, for one thing (just the thought of the power bill makes us cry). Inside you’ve got the pawn shop, decked out in oak panelling, artful metal cages, glass-topped display cabinets (of the sort favoured by butterfly collectors in the 1870s) and retro novelty goods. Beyond that is the arcade, which is pretty much what you’d expect at Crown’s Playtime or maybe Bartronica. There’s racing games, shooting games, giant spin wheels, tabletop RTS, basketball hoops, old-school beanbag toss (still surprisingly fun), and enough flashing lights to trigger mild epilepsy. The gaming system is what you’d expect these days. Instead of feeding dollar coins into the machine, you sign up for a B.Lucky card at the bar. That’ll get you a set amount of playtime (which you can top up), and you scan the card to play the various games. Any tickets you win are stored in your pocket. When you want to cash out, and claim your prizes, just head to the ticket counter. Of course, you don’t have to be a gamer to enjoy B.Lucky. You can bypass the arcade all together and head straight for the cocktail bar, down back. The mixologists here all wear vests and old man flat caps like it’s 1934. There’s a bunch of group tables, a futuristic spaceship booth thing, and even a cheeky open-air roof terrace off to the left. The food isn’t exactly fine dining, but it’s not party pies either. B.Lucky have gone for stone-baked pizzas, topped with everything from pulled pork and veggies to chips, gravy and sausage. There’s also five sides in various shades of golden brown: a ‘Fry Up’ of spring rolls, samosas and dumplings, bags of prawn crackers, crispy chips, doused in gravy, lotus root chips with a spiced mayo, or the ‘Jammy Codger’—fish-shaped ice-cream with a dollop of strawberry jam in the centre. Better are the cocktails. The list isn’t huge, but it’s packed with fun and flavour. You should probably start with one of their signature bubble cup mixes (Melon Snap might be the best—it’s a mix of Midori, white rum and green tea). The bubble cup cocktails also come with a toy panda hugging your straw (we’re pretty sure you can’t take these...) If you’re after something more traditional, the guys are slinging classic cocktails, canned bevvies and a select range of wine. Our advice? Leave the vino—you don’t come to a bar with unicorns on the logo to sip Pinot Grigio and talk mergers. Grab the gang and give this place a crack. In some ways it’s not a new idea—booze and arcades have been combined before (just look at Bartronica). But the execution is pretty cool, and being able to convert Point Blank badassery into Botox vouchers is something no other venue on Earth can boast. B.Lucky definitely has our attention. The real challenge will be how long they can hold it. Want to learn more about B.Lucky? Check out our Directory page.